The radial drilling machine model Z3025 , Z3032, Z3040 is a new series with diversified functions of product which has been designed and accomplished referring to the intermational standards (ISO) in the recent years. In this machine, hydraulic preselection speed and feed change mechanisms are adopted. 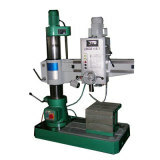 The spindle head, radial arm and columns are clamped by the hydraulic clamping mechanisms, and the forward, reverse, stop (braking), as well as the setting of spindle in neutral position are all controlled by a single-lever, the machine has the characteristic features of perfect performance, safe, reliable and easy operation, convenient maintenance,high accuracy, ample rigidity and long service life. It is used for drilling, counter boring, spot facing, reaming, tapping and boring. It is the machine widely used in every department of mechanical machining.